Looking for a fun, hands-on way to practice beginning sounds or alliteration that your students are sure to love? This low prep, high engagement activity is the perfect way for your class to practice identifying, matching, and producing beginning sounds as well as words that begin with the same sound. 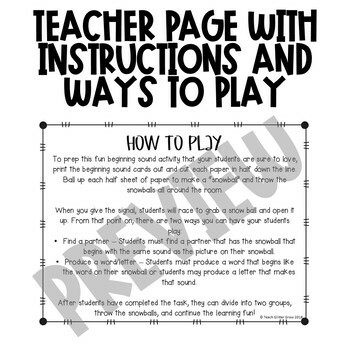 To prep this activity, print the beginning sound/alliteration cards out and cut each paper in half down the line. 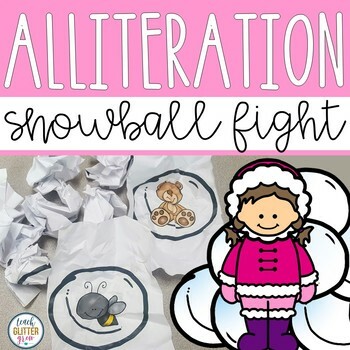 Ball up each half sheet of paper to make “snowballs” and spread the snowballs around the room. •Find a partner – Students must find a partner that has the snowball that begins the same sound as their snowball. 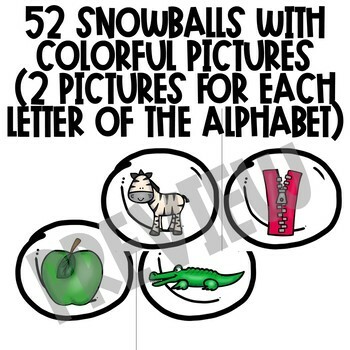 •Produce a letter – Students must produce the letter that makes the sound that they hear at the beginning of the picture on their snowball. •Produce a word – Students must produce a word that begins with the same sound as the picture on their snowball.